I've been blogging for ten years now, and over the years I've purchased a LOT of blogging courses. Some of them have been good, others were less than stellar, but only a few have been great! In fact, there are so many blogging courses on the market that it's almost impossible to know which ones offer real value. Bloggers who are selling courses highlight big social media numbers and page views, and they have persuasively written copy, which makes it hard to resist making a purchase. I know because I've been swayed into many purchases from alluring vanity metrics and hyped-up verbiage. If you're searching for a blogging course that will take your blog to the next level, and that offers true value and results, here are some (in a variety of price ranges) that I've taken and personally recommend. Okay, this one isn't a full-on blogging course, but it's an excellent book and it's highly affordable at $8.32! I read this many years ago, and it is one of the best blogging books that I have read; believe me, I've read a lot! It offers Ruth Soukup's (Living Well Spending Less is her blog) unique take on blogging, concrete examples, and information that is not widely rehashed on the web. It covers content creation, presentation, getting traffic, viral growth, monetization, ad networks, affiliate marketing, private ad sales, working with brands, providing services, and productivity tips. If you're curious about blogging, or just starting out this is an excellent read that's packed with a lot of value, and it gets a 4.5-star rating on Amazon. Yes, I'm a little biased on this one because I contributed a chapter to it. Again, it's not a course, but even so, it's an excellent read receiving a 5-star rating on Amazon. What I love about this book is that it contains tips and advice from 17 successful bloggers who are all earning at least six-figures a year. Even though I've been blogging for ten years, I came away with many useful nuggets after reading this book. With a price tag of $14.99, it's a great read for new and experienced bloggers alike. The Genius Blogger's Toolkit is unique because it's not a single course, but instead, it's an assortment of blogging courses, e-books, and memberships all wrapped into a bundle for one low price. Once a year the Genius Blogger's Toolkit goes on sale (usually October) and it contains all new blogging courses and resources for $97! I've purchased this the last three years in a row, as it always has a handful of courses that benefit my business. No matter what area you need assistance, or where you're at in your blogging career, this bundle has you covered with a wide variety of resources and courses for all your needs. Because this only goes on sale a couple of times a year — you'll want to sign up for the waitlist here. I interviewed Michelle on The Work at Home Woman years ago. Since that time her blogging income has skyrocketed to the tune of $100K+ a month! Yes, you read that right, 100 thousand dollars a month! How does she do it? The majority of Michelle’s blogging income is earned through affiliate marketing, and in this online course, she’s sharing how she does it. What's really cool is other bloggers who have taken Michelle's course are seeing incredible results in short amounts of time. The course includes six modules, 30 lessons, course workbook, bonuses, and a private Facebook group which is worth the price alone. In this course, you'll learn all the nuts and bolts of affiliate marketing including how to find affiliate programs, necessary rules, and guidelines, how to get your readers to convert, advanced strategies, and tons more. This course is perfect for beginners, and intermediate bloggers who aren't seeing the results they want from affiliate marketing. If you want to master the art of affiliate marketing — this course is a must. Currently, the cost of Making Sense of Affiliate Marketing is $197 or two payments of $99. But, I'm sure this price will go up soon — as this course digs deep into affiliate marketing and it produces results. Michelle offers a 30-day, money back satisfaction guarantee on her course. I purchased this course a couple of years ago because I wanted to focus more on working with brands. It's an excellent course (video along with written content) that was created by Julie Solomon who is a publicist turned blogger and influencer marketing educator. In this course, you'll learn how to pitch brands, how to price your services, how to create a media kit, and how to negotiate deals; she also includes some templates for getting started. This course also includes access to a private Facebook Group which is worth the price of admission. I've recommended this course to a couple of my blogging friends and they've said that it's way better than similar courses on the market. This course is excellent for new and experienced bloggers alike. If you're wanting to break into sponsored content via your blog or social media profiles, or you want to one-up your sponsored game like I was — this is the one you'll want to choose. This course is priced at $499 and is available for purchase at any time. I found out about this course because I had purchased Ruth's book (mentioned above), How to Blog for Profit Without Selling Your Soul. It was one of the best e-books I had ever read on blogging, so when Elite Blog Academy (EBA) came around it was a no-brainer. In fact, this is the one blogging course that I can attribute my exponential growth in the past couple of years. Before I took this course, I was supplementing my blogging income by working part-time as a Social Media Manager. While this was a good gig, it wasn't where my heart was. But to quit, I needed to make more money from my blog. So, I decided to purchase EBA, and I'm so glad I did! In one year, I was able to increase my blogging income 155 percent, and I was able to quit my side social media job which allowed me to focus full-time on my blog. I've never been happier or made more money in my professional life. It consists of 12 units videos, 16 handouts, 30 assignments, four live Q&A webinars with Ruth, membership to private Facebook Group, and tons of bonuses and material. In the course, you'll learn how to refine your message, grow your traffic, monetization techniques, as well as how to build your business. This course is good for beginner and intermediate-level bloggers who are looking to grow and increase your traffic and income. The course is completely redone every two years with new videos, course updates, and new material. 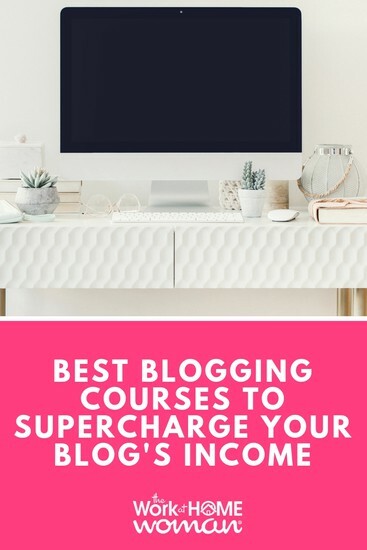 Enrollment for this training course only opens up ONCE a year in March, so be sure to sign up for the waitlist and grab Ruth's FREE e-book, 7 Surefire Ways to Boost Your Blog Income Overnight. The total cost is $997 and you get lifetime access and free updates. To be successful with any of these blogging courses — you have to put in the work! Success is not going to happen overnight and to be blunt; it’s not always going to be easy. But if you’re willing to put in the effort, complete the lessons, and work ALL the way through the course — you can be successful. If you're not fully committed to doing the work — you won't see results. Period. If your dream is to start a blog, then you'll want to head over to this post, which offers easy, step-by-step instructions for getting started. Good luck on your blogging journey! Originally published November 2, 2016. Content updated April 8, 2019. This page includes affiliate links. Please be aware I only promote companies and products I feel I can legitimately recommend to my readers. Please see my disclosure policy for further information. I was gifted a copy of the course, Making Sense of Affiliate Marketing. Wow, I was looking at this review of a course Savage Affiliates, but I must say after reading your post I am considering a different option. I’ve never heard of that course. Michelle’s course is great for learning the basics of affiliate marketing. Hi! Not sure if anyone asked this question yet, but I am a photographer so I’m not looking to blog for a living but I definitely understand the power a blog can have for my business and my “blog”.. is well… just that. A “blog”. It’s pretty bad. What would you recommend for me? Are you looking for a blogging course on how to write blog posts, or how to use a blog to market your business? Are you looked at Skillshare? They have a ton of online classes that can help you market your business. I love the list it’s incredible, I’m currently am studying Yaro Starak’s training; How To Make $10,000 Per Month, ‘Working’ On Your Blog Only 2 Hours Per Day! Hello – Thank you for this blog. I am wondering what sort of blogs can make money. What sort of blog themes are truly profitable? Do you know if this is addressed in the course? Thanks so much! Hi Doreen, Which course are you interested in? It doesn’t matter what blogging niche you’re in — these are applicable across the board. Happy to answer any questions you may have about them.